One could say that the Nazi's were more than meets the eye. I believe Nazis were in Germany, not Russia. One could say that the Communists were more than meets the eye. The Nazi's might have been more than met the eye, too bad Stalin and the Soviet Union were commies. Does that mean America gets to be Megan Fox???? That;s obviously Gurren Stalin in the picture. Note the two faces on the mecha. Trust him, he's the doctor! The Soviet Union was communist, the Nazis were in Germany. HAHA, I agree, who needs text when you can draw like that! 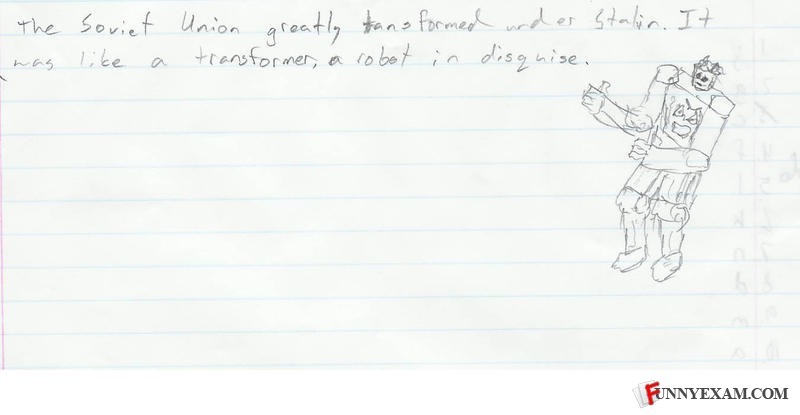 Communism: More than meets the eye. everybody knows the soviet union was evil cuz isn't that where the jonas brothers came from? The text is actually just superfluous when he has that good illustrating picture. lol is that gurren lagann! Hey, at least no Kirovs. we all knew the soviet union was evil because if it could spawn demons from hell like the jonas brothers and HM who knows what theyre capable of!?!! That robot is totally jammin' though. Dancin and stuff... and he has his thumbs UP. He can't be a Nazi. Don't stop him. He's on a roll !